We’ve seen quite a warm-up the past week. 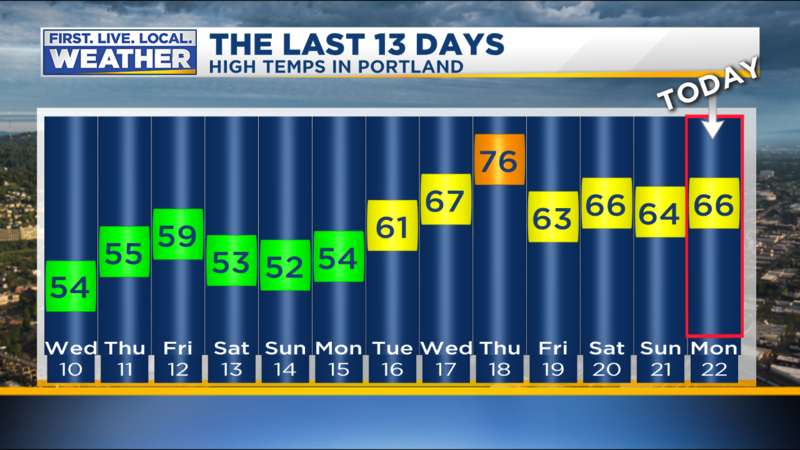 We spent about two weeks in Portland with highs near/below average ending the middle of last week. But since last Wednesday temperatures have “stepped up”. Every day has been in the 60s and of course we hit 76 last Thursday. After a very wet start to April, we’ve dried out quite a bit too. 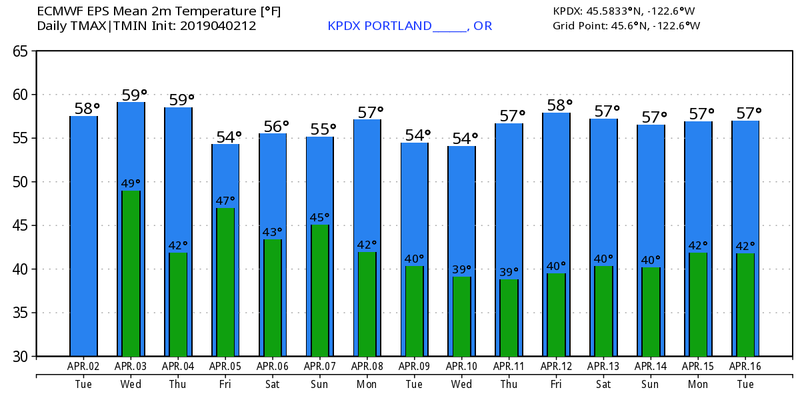 The last 10 days we’ve seen very little rain, less than 1/2″ in Portland. 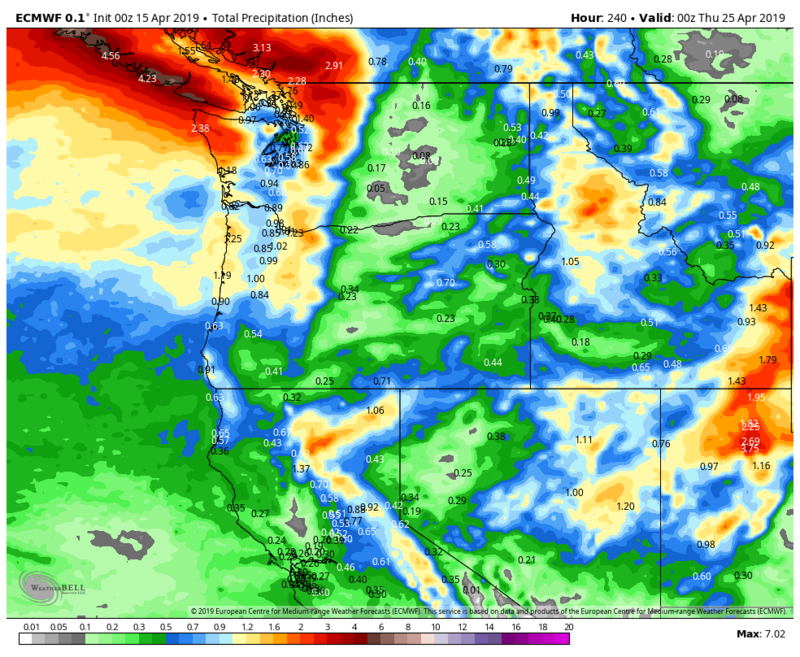 Of course it has been VERY wet across much of Oregon the past 30 days. 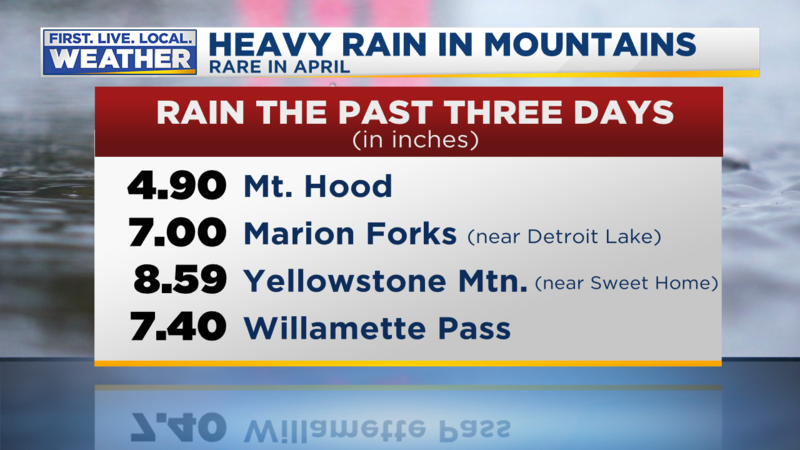 Some spots in Eastern Oregon have seen 2-3 times typical April rainfall! So it’s about time we dry out a bit. Tonight a weak cold front drags across southern Washington and northern Oregon. 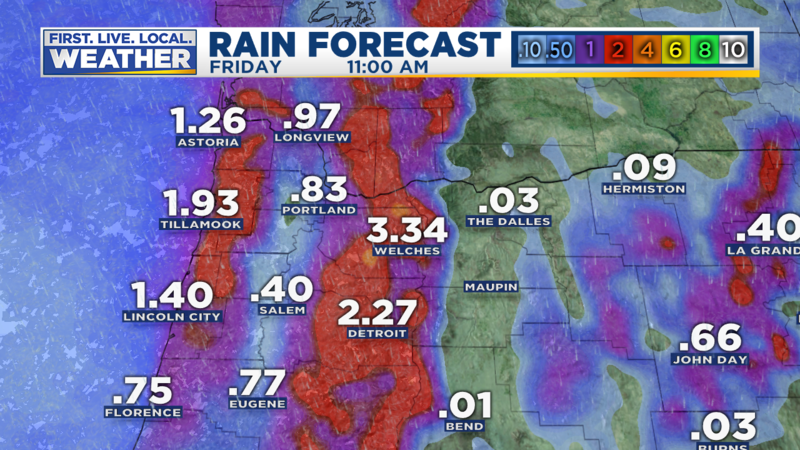 Most rain/showers will be in Coast & Cascade ranges plus west slopes & foothills. 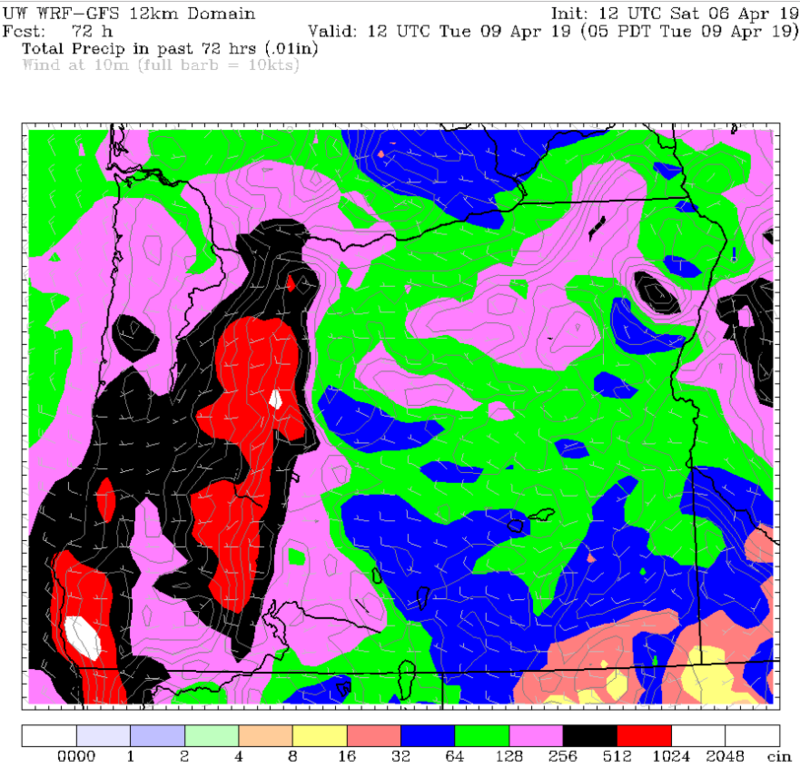 WRF-GFS shows just a few sprinkles west metro and up to 1/3″ the next 24 hours in the western Gorge. Expect a brief soaking far east metro and west slopes of the Cascades later tonight and Tuesday morning. All of us see sprinkles or light showers the next 24 hours but “wet” conditions will be mainly east metro. Beyond that a weak northerly or northeast (offshore) flow takes over Wednesday through Friday. Lots more sunshine and temps warming above normal once again. 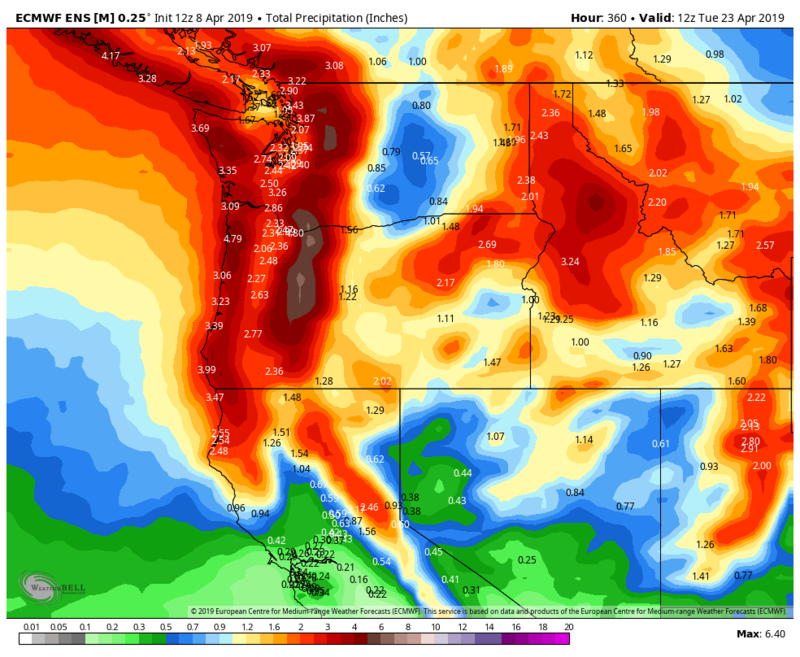 Take a look at 10 day rain forecasts from the GFS, ECMWF, & GEM models. All are drier than average for the end of April and early May. In fact all three produce less than 1/2″ rain in much of the metro area through a week from Thursday. That said, we’ll see a cool/showery upper-level trough move by just to our east coming up on Saturday/Sunday. This is a cool pattern, but not very wet. The ECMWF 10 day precipitation anomaly shows a drier than average western USA. This could be a setup for a late season frost in outlying areas early next week too with cool and dry air in place. So don’t plant those warm weather veggies yet! I haven’t heard any complaining yet, but if showers continue I think the whining will be just around the corner. 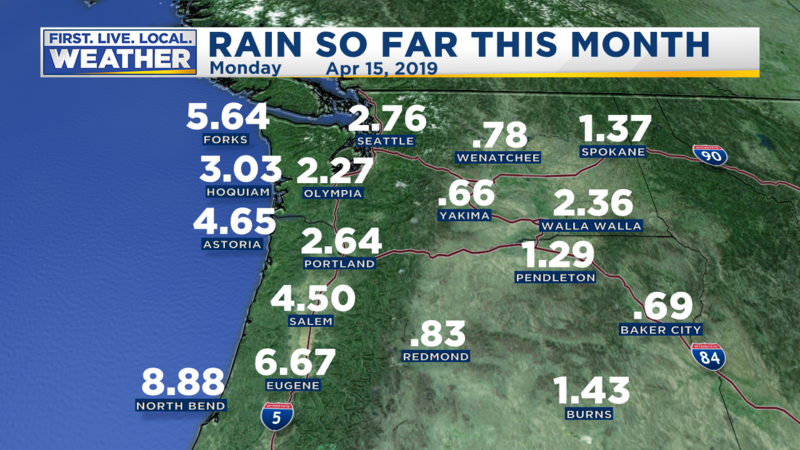 This first half of April has been VERY wet west of the Cascades, especially south of Portland. East of the Cascades it hasn’t been exceptionally wet, but wetter than average. By the way, when we say “average” that typically means a 30 year average. We’ve seen measurable rain 13 of the first 15 days this month. Spring weather has actually been warmer and drier than normal much of the time since 2012. The last truly “chilly spring” was 2011. Both 2016 and 2018 saw quite warm conditions in April/May. 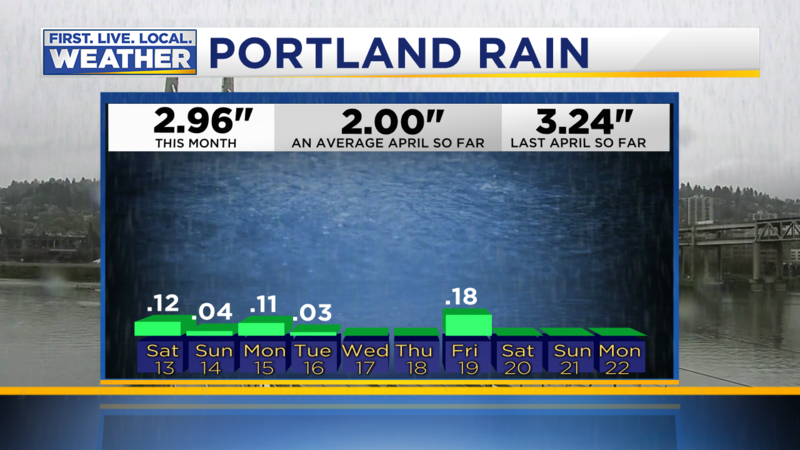 Last May was the warmest on record in Portland and we saw very little rain from this point forward all the way through the summer! So one could easily argue that we are overdue for a cool and wet spring. It’s time. But so far that hasn’t really been the case. March was quite dry, but that almost balances out the wet April so far. March averaged out cool, and April has been a little warmer than average. That’s a “normal” spring so far temperature-wise. Again, we’ve had some real decent springs lately. There is one reservoir that has filled beyond the “TOP OF FLOOD CONTROL” level; that’s Dorena. It is spilling water “uncontrolled” today, which just means water is going over the spillway as it is designed to do during a flood. That DOESN’T mean water is going “over the top of the dam”. That would be bad and that’s definitely not the case. Then there are 5 reservoirs (in yellow) where water is within 2 feet of that spillway level. Luckily at most of those the incoming water volume has slowed quite a bit. A 50 foot rise in the past week! Right now the lake is up to just 8′ under its “full” summer level of 1563.5′. That lake is still 15′ or so away from an uncontrolled spillway release; plenty of storage available. If another atmospheric river event with many inches of rain were to show up in the next few days? We’d see widespread flooding in the Willamette Valley due to little water storage left. Luckily that is NOT the case. Sure, there will be more rain in the upcoming week, but not too heavy. 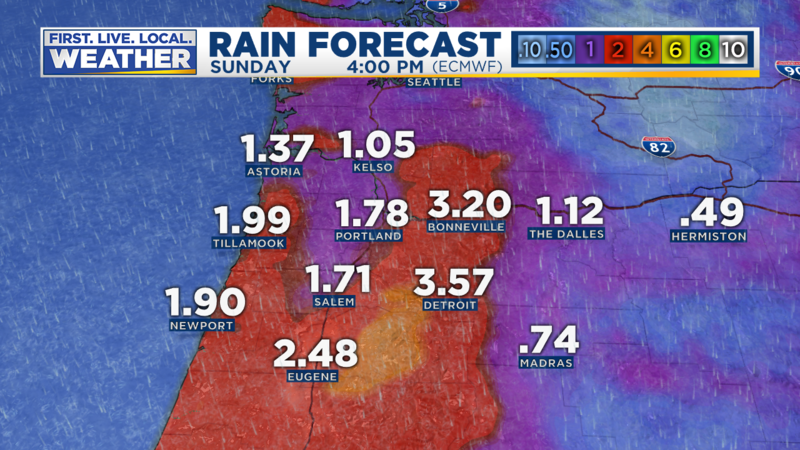 RPM model shows 2-4″ rain in Cascades the next 3 days, then lighter totals through the weekend. I figured it would happen at some point and here it is. For the first time in my career (a quarter century!) we are getting Willamette Valley and Cascade foothills flooding in the spring. The latest I’ve seen it in the past is February. 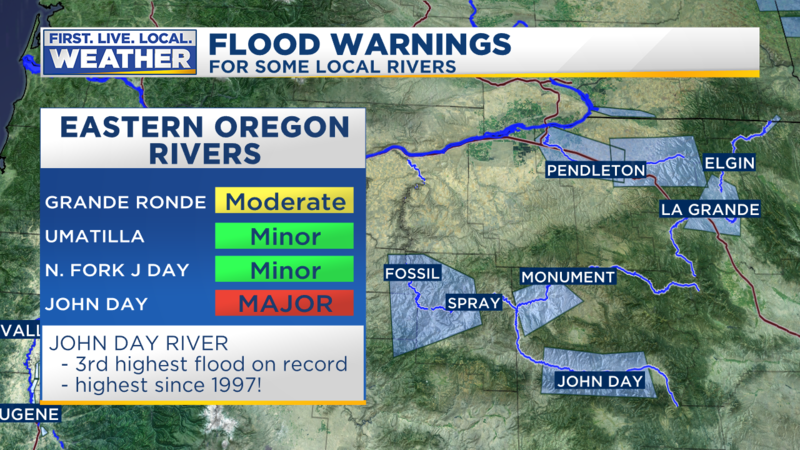 At 6pm there are 9 rivers under flood warnings in Western Oregon. Another 5 are under flood warnings in eastern Oregon, although that is not as unusual in springtime due to rain + snowmelt. The past three days a series of weather disturbances have moved into Oregon from off the Pacific. 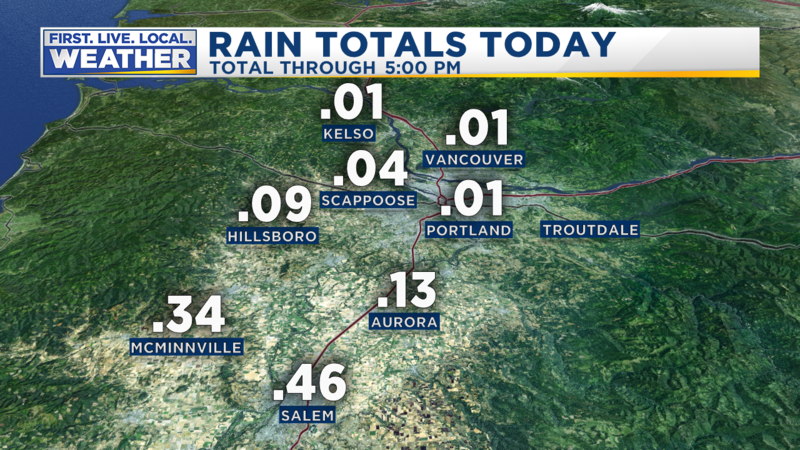 The nearly continuous flow of moisture has dumped unusually heavy rain in the central/southern parts of western Oregon. Models did an EXCELLENT job handling the rain forecast. Here’s the 3 day rain forecast from Saturday morning’s WRF-GFS model. 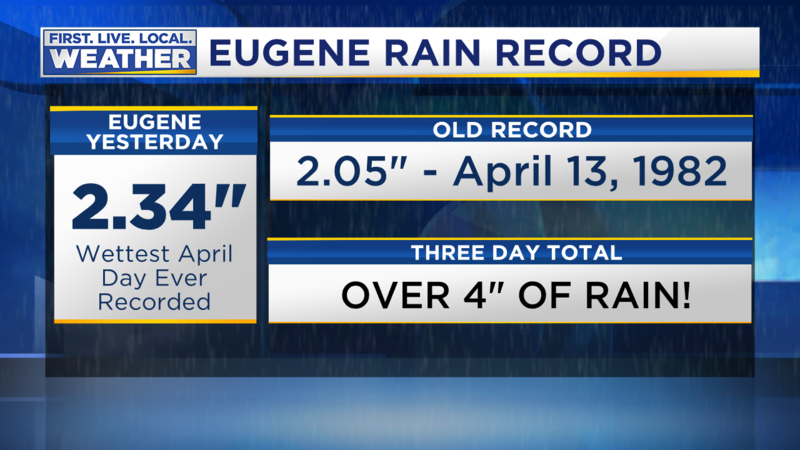 It showed widespread 5-10″ rain totals in the central Cascades and a clear bullseye on Eugene/Roseburg in the western valleys. This is the same area hit by the massive snow storm in February. 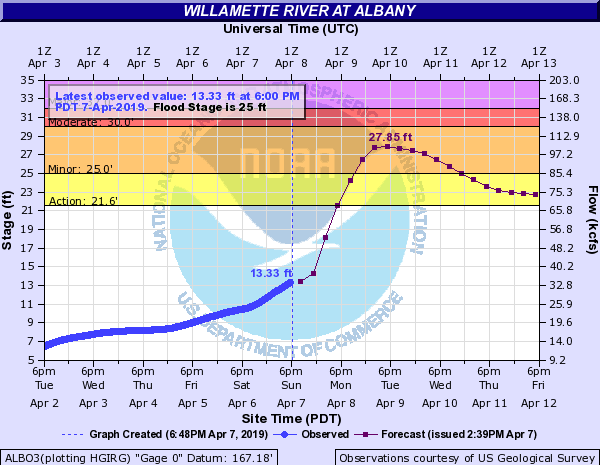 The more reasonable rainfall in Northwest Oregon mean less flooding north of Albany. 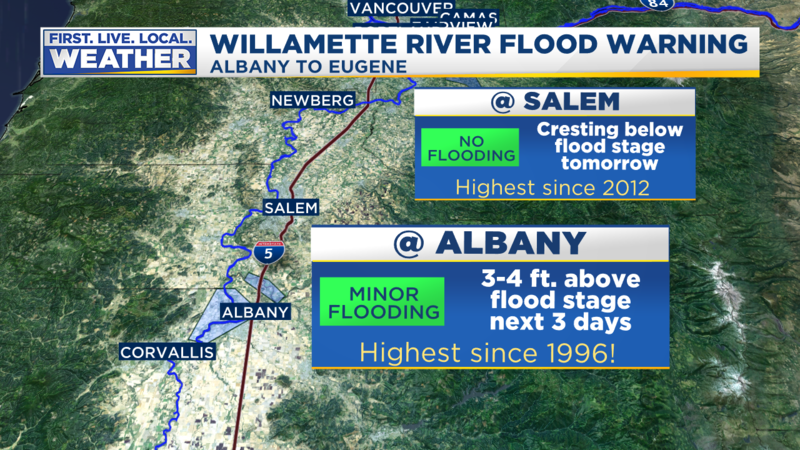 The river will crest a foot or so below flood stage at Salem tomorrow, still the highest in 7 years. I checked both forecast locations and found there are no major river crests in March or April in the historical database. 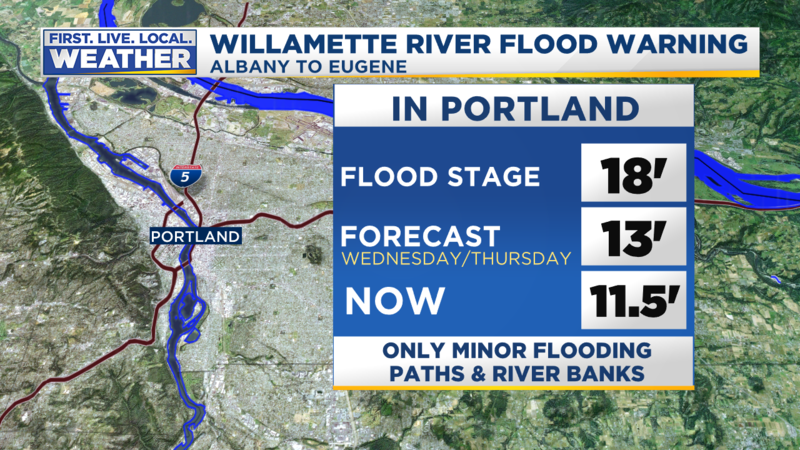 In Portland the Willamette River will stay well below flood stage due to less rain up here. We have seen higher levels in May/June in the metro area in recent years due to high water on the Columbia River. A cool and showery pattern continues for at least one more week. 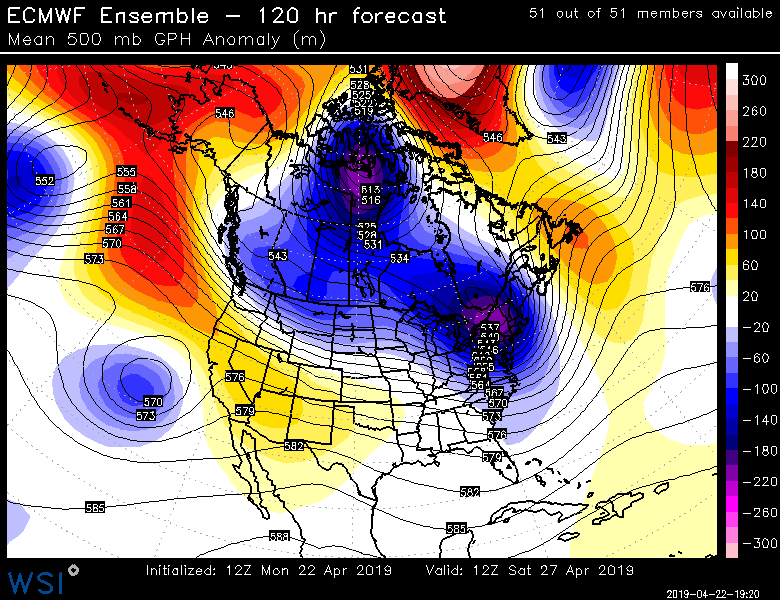 The ECMWF ensembles show another 2″ is possible in the valleys during the next two weeks…wet! 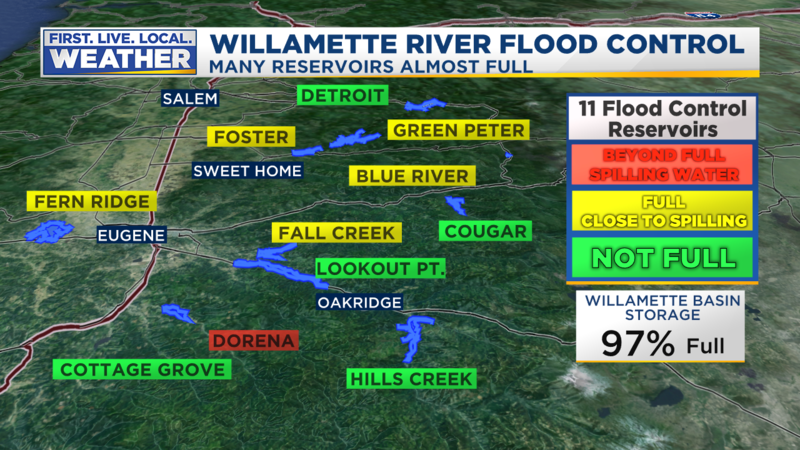 Without the storage available on 10 different Willamette Basin projects, flooding would have been huge right now. 70% of Oregon’s population lives within the Willamette River basin. Several reservoirs are near capacity after rapid filling the past few days. Green Peter, Dorena, Blue River, and Fall Creek lakes are pretty much full. The first number is percent full, the 2nd is where they are compared to the “control curve” which is where the Corps of Engineers would like them to be this time of year. 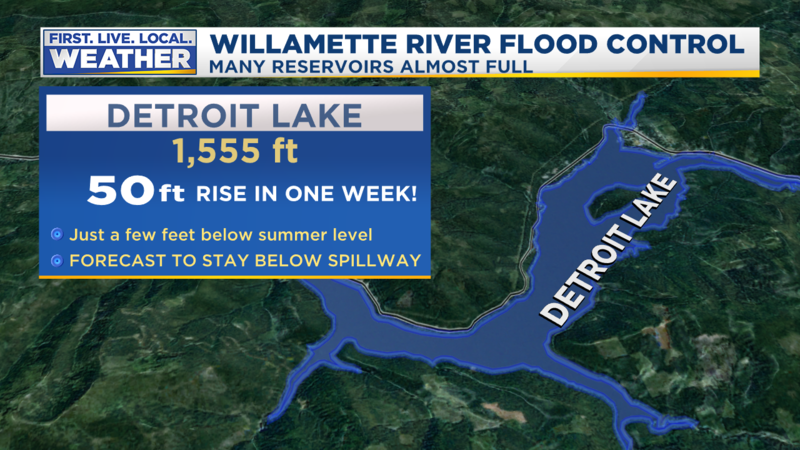 Detroit Lake was well below normal a week ago, but has gained 40′ in just a week! It’s got about 22′ to go to “full pool”. It has filled that much in just the past two days. So…if the rain will at least slow down to more typical April showers we might be okay. But clearly there’s not much room left for another heavy rain event in the next week or two. Regardless, the Willamette River will be running high for quite awhile. Farther south the rain has been much heavier. Approaching 3.00″ at this hour! When the strong westerly flow runs into the Cascades, air is forced to rise and cool, squeezing even more rain out of the airmass. A few spots have seen over 5″ with another wet 24 hours to go. Minor flooding is occurring or will happen in the next 36 hours on several rivers, mainly in the central/southern Willamette Valley and Eastern Oregon. Moderate flooding is forecast along the Coast Fork Willamette River from Cottage Grove through Creswell and also along the John Day River. 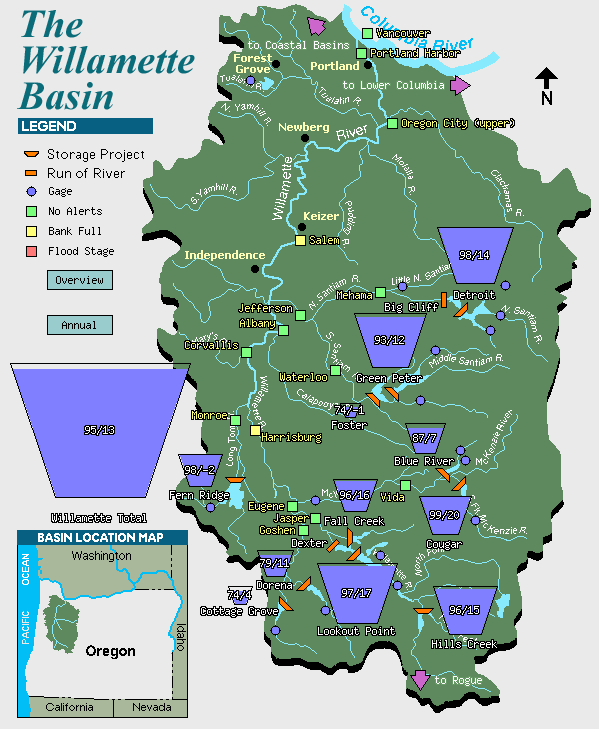 Since less than 50% of the Willamette River basin is regulated through reservoirs (north of Eugene) it IS possible to get flooding without having those reservoirs full. An example is the river forecast plot (modeled, not a forecast) for Albany. At this point the river could rise 14 feet in the next 2 days. That’s a lot of water! After one last wave of moisture moves through tonight, we’ll be back to showers & sunbreaks Monday (much brighter!). I think there’s enough instability that a thunderstorm or two will pop up inland; especially since the atmosphere overhead will be relatively warm. Highs should make it into the lower 60s west of the Cascades. 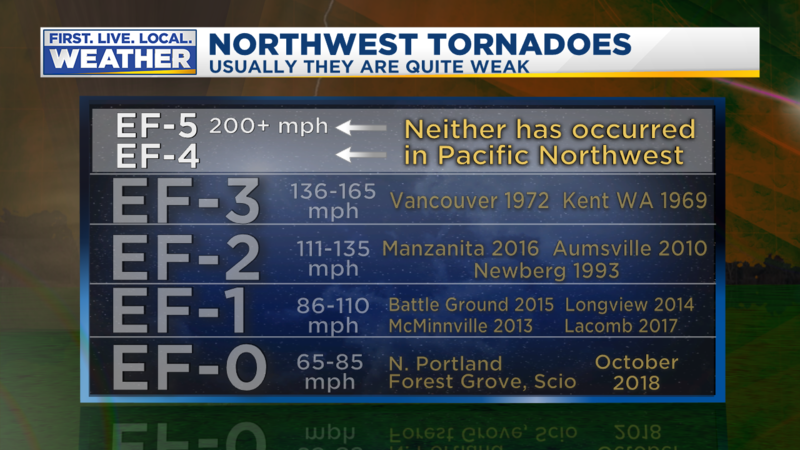 It’s pretty well-known that the Pacific Northwest isn’t in “tornado alley”, but I think most of us know that we do occasionally get weak tornadoes. Official tornado counts go back to around 1950. 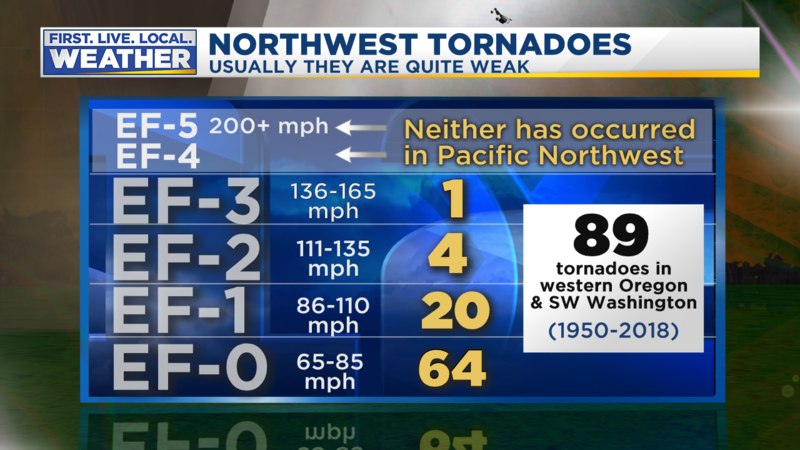 Since that time in western Oregon, plus the SW Washington counties, 89 tornadoes have been reported. That’s 89 in almost 70 years! Obviously they aren’t too common. The vast majority are weak; EF-0 or EF-1 category. There were 3 in our area last fall, but all were EF-0 causing minor damage. Lots of us remember the Manzanita tornado in October 2016 and Aumsville in December 2010. Those both went right through the middle of small Oregon towns, a rare occurrence. Tornadoes come out of strong thunderstorms and we don’t get many of those west of the Cascades. That’s the main reason we don’t see tornadoes very often and when they do show up they are usually weak. 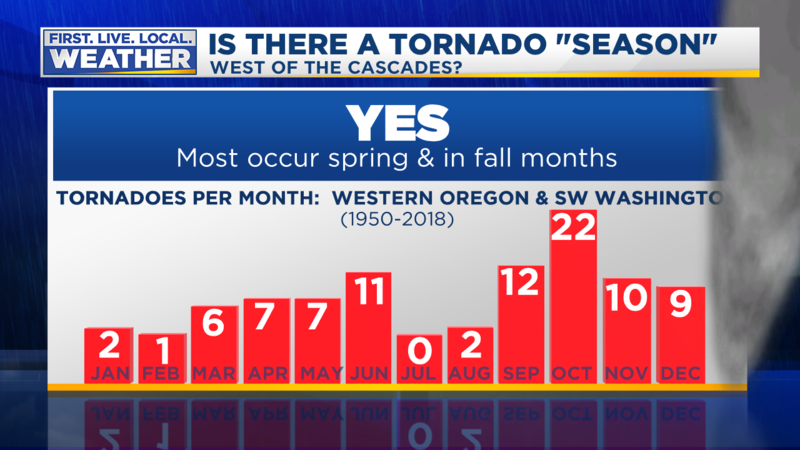 There is a bit of a tornado “season” both in late spring and fall. Notice how rare they are in mid-winter and mid-summer? Tornadoes RARELY kill people in our area but it happened just once. That was on this date in 1972. 6 people died and 300 were injured. I was just a little 3-year-old kid (living in Hood River county) so I don’t remember it, but I know many of you older folks do. A spring squall line with heavy showers and thundershowers swept through the region behind an early morning cold front. Basically we were in a “showers and sunbreaks” weather pattern we often get behind cold fronts. Around 1pm a tornado dropped out of a thunderstorm near NE 33rd and Marine Drive in Portland. This was just west of PDX and quite close to the National Weather Service office (at the airport). 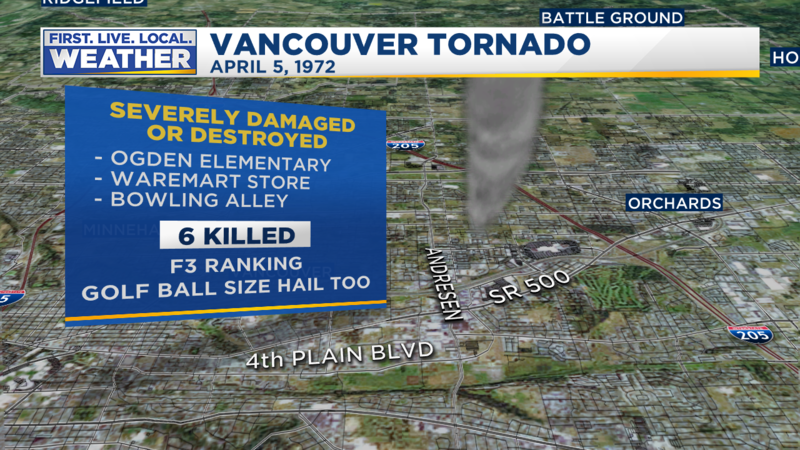 Tornado quickly moved across the Columbia River and through central/east Vancouver on a 9 mile trek toward Brush Prairie. The deaths all occurred in a several-block stretch. From around the Fort Vancouver H.S. track to NE Fourth Plain and NE Andresen Rd. Just a few minutes later the tornado was gone after skipping out to Brush Prairie; lifting off the ground several times. Ogden Elementary school was not rebuilt in the same location. Instead a “new” Ogden Elementary was built about 3/4 mile to the northeast in just 18 months! There have been hints of a surface low moving close to the coastline Friday or Saturday, but each model and model run has been different. It IS possible to get a windstorm in early April (April 7th 2017 storm) but rare. I’ll keep a close eye on that possibility. Otherwise it’s all about showers, sunbreaks, and make-up time for the very dry March. We only saw about 50% of our typical rain last month. Those surface temps are typically too cool, it’s fair to add about 5 degrees to those temps. It can get quite warm (usually just for a few days) in April. Last year we hit 86, and the all-time record is 90 in Portland. More typical is a monthly high somewhere around 80. April is typically also a month where we transition from wet to dry. Some years it’s a soaker, other years quite dry. Last year was unusual with a tremendously wet first half then our dry season began the second half of the month. May was extremely dry last year as well.